Contrarian trading is a way to profit from crowd behavior. Most successful contrarians know that this requires understanding and then anticipating the dynamics between market participants. The most important dynamic is the interplay between the “price-maker” and the “retail trading segment” – in other words, the unsophisticated traders. In this post I’ll examine one particular topic of contrarian trading; namely historical patterns. The ideas that I am sharing in this post helped me to generate consistent profits over several years of intraday FX trading and helped me become one of the top 14 Trade Leaders in Currensee. Currensee was the forerunner to newer social trading platforms like ZuluTrade and eToro. It was once one of the largest FX trading networks in the US, with thousands of live trading accounts connected to it. Some details of the performance during this period are posted on the European Central Bank’s website here (page 29) and on FXDD’s Japanese language blog here (page 15). Contrarian investment and trading is about doing things differently. In essence it means identifying what the majority of market players are doing, and then doing the opposite. For example if everyone is buying an asset the contrarian is selling and vice versa. 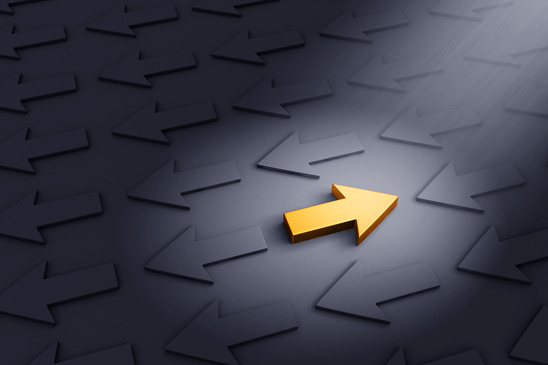 A common misconception is that contrarian trading is about trading against the trend. Contrarian trading is not about trading against the direction of prices. Rather it is about trading against the majority of market participants who are behaving as a crowd. For example, if the majority expects that a trend will reverse, the contrarian trader will continue to trade in the direction of the trend. On the other hand, when the majority expects that the trend will continue, the contrarian will start positioning for a trend reversal. The first step towards being a contrarian is to understand the market participants in terms of their performance and sophistication. Figure 1 below shows how a contrarian would typically classify market participants. 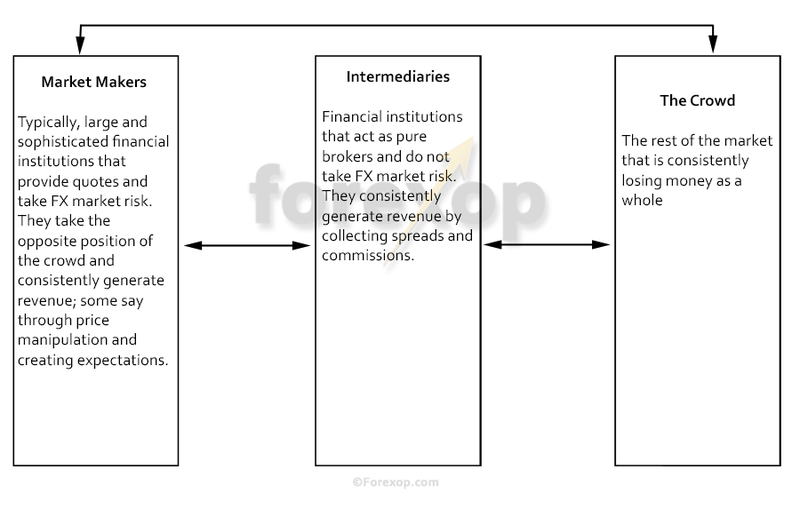 This diagram shows participants in the foreign exchange (FX) market but it holds true for almost any other “off-exchange” financial market as well. FX trading, at least in the very short-term (think intraday traders) is a zero sum game. By this I mean one person’s gain is another person’s loss. Within this space the general consensus is that market makers are consistently making money and the crowd is consistently losing. For example, one subgroup of the crowd is the community of retail traders. The corresponding subgroup of market makers is those financial institutions and brokers that take the opposite side to the positions of retail traders. Table 1 and 2 shows one recent US study in which retail traders as a whole are consistently losing. Small players are price takers. They are trading on prices provided by market makers and are not part of the price formation process. Retail traders are probably the least successful subgroup of the crowd. However the above factors may also impact other subgroups that make up the crowd. For example, these can be non-financial companies, as well as small to medium asset managers. Overall, the less informed market participants are more likely to face losses in the market. And those with less sophisticated risk management system are more likely to behave emotionally when met with uncertainties. This results in mistakes. Of course not all retail traders will lose. Many individuals are highly successful. Rather, I am classifying the aggregate performance of the entire group. We also have to remember that for many participants, FX simply plays a functional role in meeting foreign exchange needs. For these players, profit is not even an issue. To summarize, within the various subgroups of the FX market there are ample opportunities for the contrarian to act on bias and inefficiency. The next section shows how I do this this in practice. In order to construct a contrarian strategy, the first task will be to look at the main assumptions that lead to negative returns and then adopt the opposite position. For example let’s take one of the most widespread assumptions behind naïve trading decisions. This is the assumption that “history will repeat itself”. 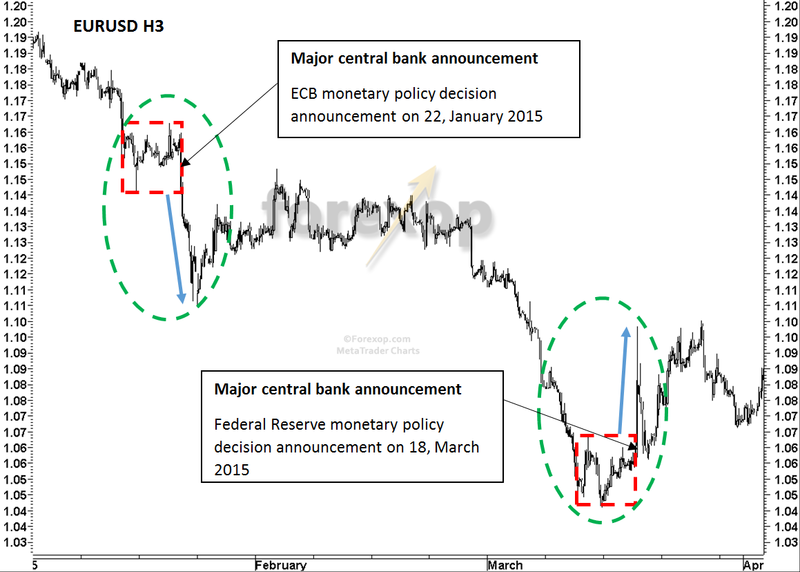 In reality, FX markets are always in a state of flux and nothing is permanent besides change. While some events may appear extremely similar, careful analysis shows that history never repeats itself in exactly the same way. To build a contrarian trade against this popular assumption, we need to find extremely similar situations and trade against the repetition of that event’s history. In other words, we need to detect when the crowd, consciously or subconsciously, is expecting that history will repeat itself. Let’s look at couple of examples. Figures 2 and 3 shows two similar technical patterns on the EURUSD chart. In both cases the pair initially moves up a distance of about 180 pips from a significant minimum (circled in red). These moves were initially slow with low volatility. Then in both cases, after facing some resistance, the pair moved up sharply about 380 pips. Figure 4 shows the 24-hour volatility chart during the same period. As can be seen two distinct peaks occur at these two events. These are circled. The contrarian view: Taking the contrarian view I now assume that the crowd will expect history to repeat itself. Namely, they will assume that the next move of the second pattern from point D1 on Figure 3 will be down 420 pips to 1.0960. As EURUSD initially turns bearish, more people will start to believe that it will reach to 1.096. The contrarian trading idea, based on the notion that history will not repeat itself is as follows. The entry point is such that the size of the stop loss in pips is no greater than the take profit. The stop loss is set at 1.096. Take profit is set at or slightly above 1.1380. I set the stop loss at 1.096 because in this situation there’s no point chasing the market down. If the price reaches this level I will know by then that my contrarian assumption hasn’t played out. Figure 3 illustrates the above trade. As can be seen, this contrarian prediction does indeed play out. History does not repeat itself. The market rises strongly again after an initial bearish run. This happens after meeting strong support around 1.1100 – this may have been a result of market makers having to offset their risk. This example shows another case of similarity. This time I’ll look at a technical pattern combined with a news announcement. 1680 – 1.0680 = 1000 pips. Central bank decisions were due approximately 120 hours from the start of each pattern. Figure 5 shows the complete story on the chart. The price will not break down the range again. Instead it will do the opposite and break up. Buy EURUSD before the second news announcement. Entry will be around 1.0620. 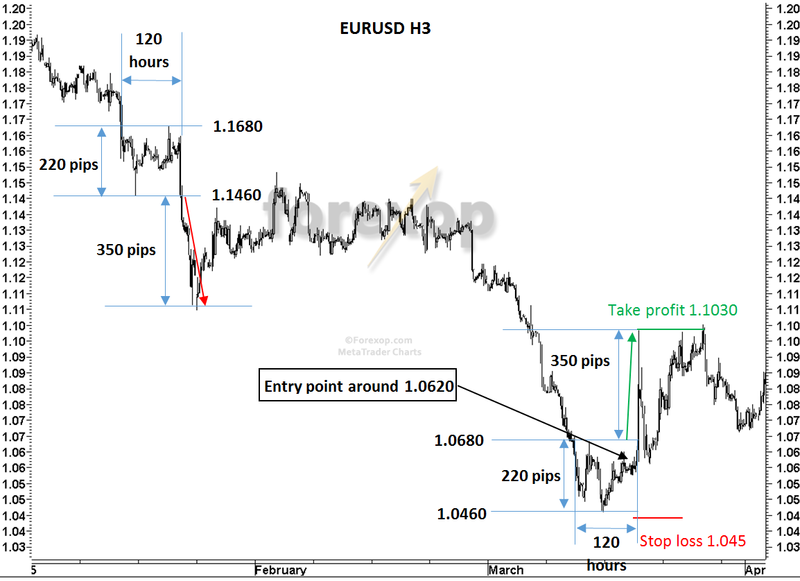 With these parameters, the take profit is at least 170 pips greater than the stop loss. That is, 350 pips up from the maximum of the range 1.0680. Again, if the price falls to 1.0450 I know the contrarian setup hasn’t played out and there’s no point chasing the market down any further. As Figure 5 and 6 shows, we didn’t see a repetition of what happened in the past. After a fake dip, the market rebounds and rallies strongly to the upside. These kinds of moves often trap large swathes of market participants into losing positions. As a contrarian, it’s my job to be on the other side. As a contrarian, it’s important to realize that you will not correctly predict every pattern every time. What you should try to do is to have an edge on the crowd. This can tilt the odds in your favor by enough of a margin to be profitable. If the similarity is simple and seen by many participants it will quickly attract large volumes from unsophisticated traders. This will create materially significant opposite positions for market makers. In this case it will be in their interest that the similarity stops so that they can reduce their risk. If the similarity is complex, it will take much longer to be noticed by enough participants to attract large volumes and become a materially important factor in the market. Due to the likelihood of mistakes, as a contrarian you will need to generate many trading ideas. This should be across several diversified currency pairs or other instruments. This will allow you to allocate a small risk to each idea and thus generate less volatile returns. i am an alpari customer and i am testing their retail trader market sentiment i am always trade against retail traders maximum volume. for example : gbpusd retail traders have 35% sell volume and %65 buy volume. but unfortunately this method sometimes work and sometimes market goes with their majority positions. do you have any idea to make decisions more accurate? Thank you! The tool from Alpari US you mentioned gives the actual positions, but unfortunately it does not give any information about expectations. That is where those open positions are expected to be closed and profits/losses fixed. In my opinion, identifying the levels of concentration of current take profit and stop loss orders of retail traders can be helpful to understand expectations. I would suggest to look at following resources from larger brokers, some of which give information not only about positions, but also about limit orders of traders. Of course these resources will not give you the complete picture since many traders do not put orders or just put protective orders far from the market. However, I think they can improve results, especially in extreme market conditions. The good example was the picture in Oanda’s open order book of EURCHF before the removal of the peg by Swiss National Bank in January 2015. At that time, in Oanda’s order book there was a huge concentration of stop loss orders just below the peg level (1.20) and about 95% of positions by retail traders were long EURCHF. This explains why we saw such a big gap dawn for EURCHF. When there is a gap over the stop loss orders, they are executed by market price and not order price. This means bigger losses for the crowd and huge profits for market makers. In addition to above mentioned resources, I would also suggest to consider following to other sources of market sentiment, such as analyst research and trading signal providers. This will also help to identify those factors that are behind traders’ positions and on which levels are orders concentrated.